designed specifically to bring more business to your automotive repair shop. More people than ever are accessing information from the convenience of their mobile phones and tablets. 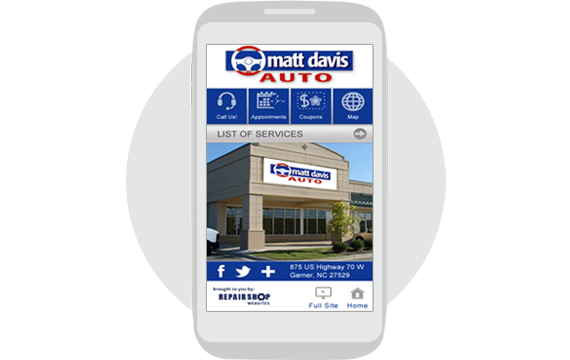 Our mobile-friendly websites are designed to look great on a phone or tablet, ensuring that your customers can find you when they’re on the go – or stranded by a disabled vehicle. Our Call Analytics system provides the data to prove that our sites drive sales, not ‘hits’ or ‘visits’. You can also listen to calls coming from people who visit your website to evaluate service quality and sales techniques. Best of all, it’s easy to use! Our review platform will help your repair shop increase online business while also protecting your reputation. We’ve designed this platform to maximize your online visibility by making it easy for your customers to post great reviews about your shop to the most commonly visited review sites.